How was your weekend? Ours was good. It was one of those perfect combinations of eventful, lazy, and productive that almost never happens but is so nice when it does. On Saturday we went to a fall fest at the park across the street where we ate snow-cones and sweated our butts off. Carrie sat in a police car and went down a big blow-up slide and poor Haddie cooked in her stroller (she's a runner, guys) while sneaking sips of my smoothie. Yesterday we went to a friend's 3rd birthday party and ran some errands. We also hung a few things on the wall, did some overdue laundry and cleaning, and I watched Friday Night Lights until Netflix asked me if I was still watching. ;) Yes indeed, a weekend well spent. 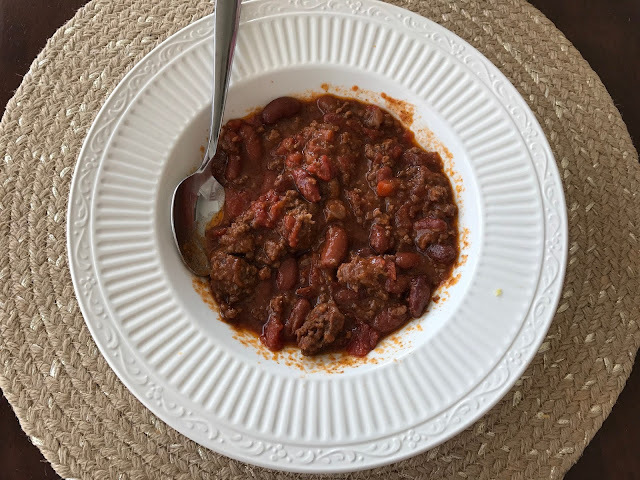 On the menu was crockpot chili, and I had been looking forward to making it all week. I followed a new recipe from Chowhound and it did not disappoint. In fact, all four members of the family (five if you count the dog, and she did enjoy some thanks to Haddie's generosity!) ate it -- you moms know how rare a 100% approval rating can be. In my mind, fall = crockpot and chili is a staple. Top with some shredded cheddar cheese and corn bread crumbles and you're good to go! The messiest & cutest chili eater of them all. If you decide to try it out, let me know how you like it. Wishing you a great start to the week! I can't wait to try the chili. Love a good crock pot meal.